in our fridge, i have a shelf full of strawberrirs and cherries too. i'm thinking i'll make a crisp, yum. your cherry tree sounds wonderful, i'm beyond jealous!! My mouth is watering -- the fruit looks so lovely! Grateful with plenty ... enough to share with the squirrels and the birds. Great neighbor you are and have!!! That's the best. I wish I has something simple like this going today and not what I'm taking on! Lucky you. Nothing tastes better than fresh cherries. When I was a kid we would eat too many of them and get sick! There's nothing like fresh-picked home grown fruit, is there? I can almost taste them. So beautiful. It's like a bowl of summer. I can almost taste the flavors in that bowl. I know the feeling, Sher. You are so right. You have cherries already? I'm so jealous. Ours won't be for a few weeks yet. We have a sour cherry tree, as well. I haven't a clue what to do with them ut I have to figure it out. The birds leave those alone! The cherry tree was the one we NEVER got fruits from. Not because it didn't produce them, but it was so tall that we couldn't pick them and the crows would have them away. Oh my god, I love you and your neighbour. You guys had such lovely harvest. Have been thinking of planting strawberries, what is a good time, any idea ? Oh, a crisp would be so nice! I hope you make it and share the photos with us! Thank you! Cherries are lovely, aren't they? Yes, I will be leaving simple behind in a few days--and it may be doing the same thing you're doing! :):) It was nice to experience something so simple. It is very nice to pick things from a garden or yard. And when you have a limited amount, it makes it even more precious! Yes, the flavors of some things speak for themselves, don't they? They don't need improvement. Oh yes! I wish I had other fruit trees. That would be so nice. What a lovely way to phrase it! Thank you! 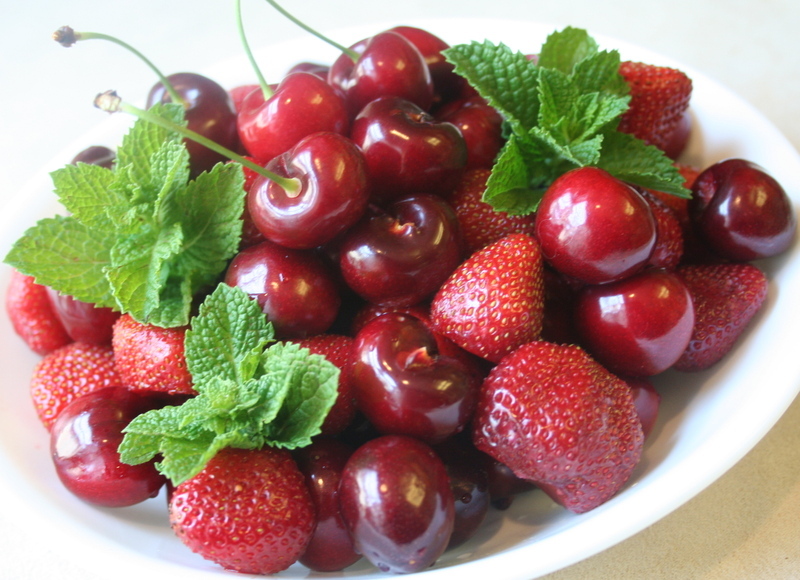 Cherries and strawberries make me feel hungry just looking at them. I kept thinking how you would be able to get a picture of the fruit that captured it's essence! They may still have some of the cherries when you get here. Not from my tree though. Ah yes! Crows were landing in our tree too! Sometimes when fruit trees get old, they don't produce as well. Not sure why that is. Maybe they just feel tired, like people! Oh strawberries are so nice. The first year you don't get much--but they start increasing every year. And the taste! Around here, we plant in the spring. Where you are, it might be the right time. I can't believe you have cherries already either. Your season is way ahead of ours. Having your own cherry tree must be wonderful, but it's your neighbor's small, flavorful strawberries that I really lust after. The strawberries I find, even those at the farmer's market, never seem to live up to their promise. Even when they have a wonderful fragrance the taste doesn't seem to be there. And yes, they're always giant. I just read a description of a strawberry called Mara des Bois which White Flower Farms says "produces aromatic fruits about the size of acorns with a rich, sweet flavor and tender flesh." I am sorely tempted to try and grow my own. That reminds me of the million cherry stands we would see on the way home from the bay area to Salinas/Monterey...you know in Gilroy they have all those cherry stands? We used to always stop by there and pick up some cherries on the way home. Yummm. Beautiful fruit Sher! 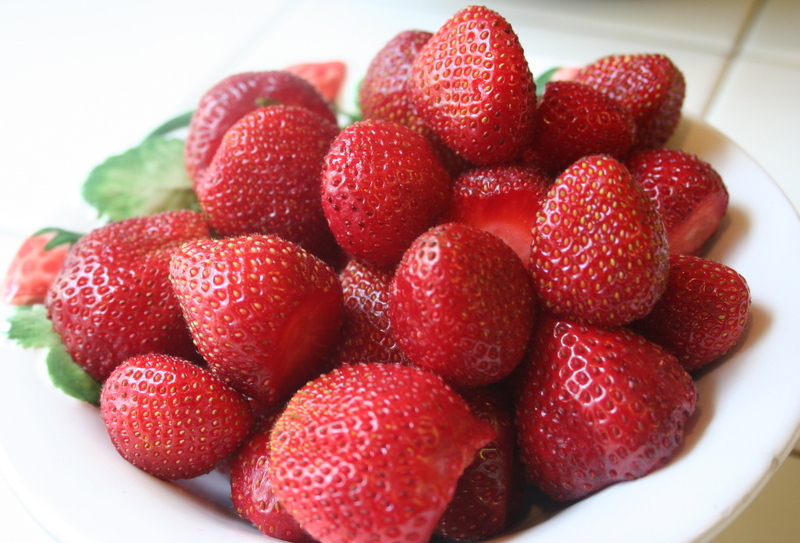 I love strawberries, but am a total snob about them. I flat out refuse to buy them in the grocery store because they taste like nothing. 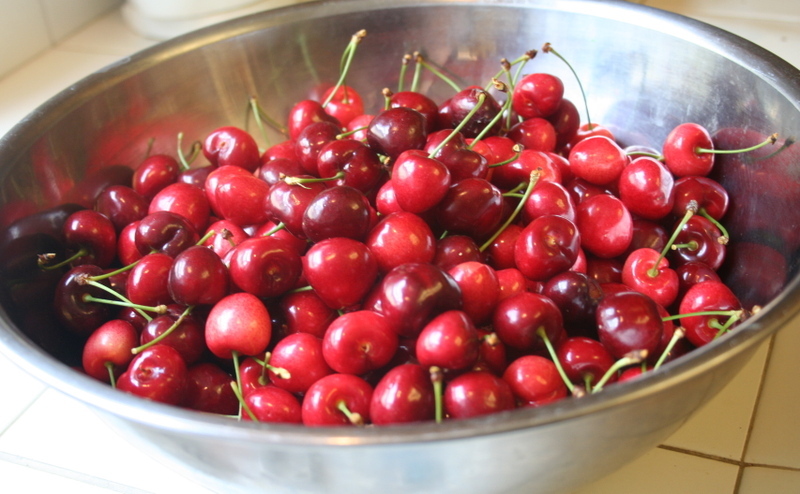 Cherries always remind me of summers in Door County, Wisconsin. How did I miss this post? Such beautiful photos. Just looking at them sets the salivary glands into overdrive! I have one, rather forlorn, strawberry plant that's producing aright, but one has to get there before the birds and slugs. Yuk! Nothing worse than a slimed, half-eaten strawberry. i would like to gain permission to use your images on your website. I went to Costco and bought cherries that looked so very good. They taste like nothing. How, indeed, can we get cherries that taste like those that came off trees that were in our neighborhood when I was a child?